Manufacturing tests of Russia’s newest T-14 Armata tank will be completed by 2016. Production tests of the T-14 main battle tank–based upon the new “Armata” universal chassis system–will be completed in 2016, Commander-in-Chief of the Russian Ground Forces Colonel-General Oleg Salyukov told TASS last week. 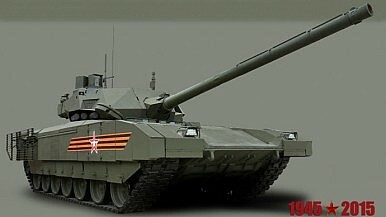 “Armata will undergo manufacturing tests. After that, a decision on operational trials and entry into service will be made. The manufacturing tests will be completed in 2016,” Salyukov said. However, Salyukov was emphatic that the Russian military’s plan to replace 70 percent of its tank corps with the new tracked vehicle by 2020 will be executed according to schedule. By 2020, Russia plans to produce 2,300 T-14 Armata models to replace the older T-72 and T-90 main battle tanks. The per unit cost of the T-14 is estimated to be around $8 million. In addition, TASS reports that the T-14 main battle tank will be displayed at this year’s Russia Arms Expo (RAE-2015) exhibition, which will be held in Nizhny Tagil in Russia’s Urals region in September. The commander of U.S. Army Europe, Lieutenant-General Ben Hodges, said in a June 2015 interview with TASS that “the new Armata tank looks like a very impressive tank.” However, exactly how impressive this new tank is remains to be seen. Russian Deputy Prime Minister Dmitry Rogozin claimed in May that an Armata shell “burns a meter of steel.” The tank’s main armament is the 2A82 125-mm smoothbore cannon, which purportedly has a greater muzzle energy than the German Leopard-2 Rheinmetall 120 mm gun. The tank is also equipped with fully automated ammunition loading and completely computerized targeting systems. In addition, as I reported last week (See: “Is Russia’s Deadliest Tank Really Invisible to the Enemy?”) the deputy director of Uralvagonzavod, the largest main battle tank manufacturer in the world, bragged in an interview with Ekho Moskvy radio station that the T-14 Armata is invisible to enemy radars. There is very little we genuinely know about the T-14. Nevertheless, one thing is for sure: costs will sooner or later become the crucial limiting factor when it comes to the tank’s hardware once the T-14 hits mass-production. Is 'Russia’s Deadliest Tank' Really Invisible to the Enemy? Some experts are skeptical over recent Russian claims. The ‘World’s Deadliest Tank’: Not as Deadly as Putin Thinks? Is Russia's 'Deadliest Tank’ Using Western Technology? Is Russia's Deadliest Tank Already in Serial Production?Will 3D Printing Speedup Production of Russia’s ‘Deadliest Tank’?Putin’s New 'Wunderwaffe': The World’s Deadliest Tank?